Dr. Gabriel Blackwell and Sandra Blake have it all. He’s a brilliant thoracic surgeon. She’s a high-powered attorney with family money. Their lives are as loving as they are glamorous. When an unknown girlfriend turns up dead, the questions fly. Just what was her relationship with Dr. Blackwell? How—and why—did she die? When an autopsy reveals the woman was pregnant, all signs point to Dr. Blackwell. How far would he go to keep his reputation? How many women are there? Are any of them safe? Tragedy strikes again as Sandra Flake is found dead and Dr. Blackwell finds himself on trial for two murders. Facing life in prison, Dr. Blackwell will grasp at any straw to preserve his freedom. 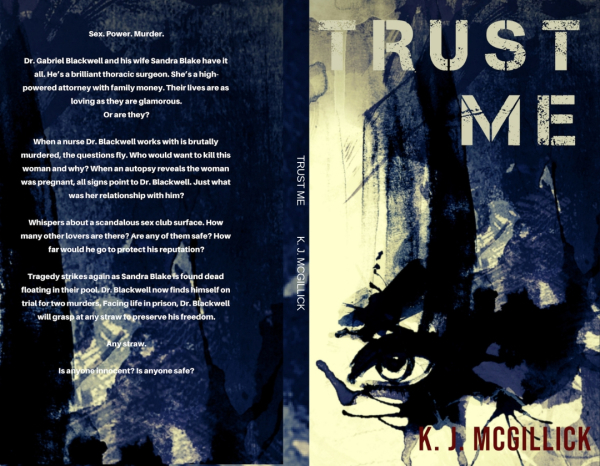 Trust Me is a fast-paced psycho-legal thriller that can be read as a standalone, or as the fourth installment of the Lies and Misdirection series.